Is your Door Closer slamming? If it is we can help. They usually slam for a couple of reasons. The first being they are out of adjustment, either by wear and tear, or environmental issues. The second reason is due to failure of a seal or other component. By teaching you how to adjust it, and looking for telltale signs of the cause, we are here to help. The first thing to understand is how a door closer works. Inside the cast aluminum or cast iron cylinder we have a spring pushing a piston. The piston is connected to a rack and pinion type device. When the closer opens, the arm which is connected to the spindle, moves the rack, which loads the spring. On the backside of the piston we have a fluid, which is usually something along the line of automatic transmission fluid. When the door is open, the spring pushes the fluid through channels in the casting. In each of the channels we have a control valve. This control valve regulates how fast the fluid is allowed to flow through the channel, which controls the closing speed. Think of it as a nozzle on your garden hose. We usually have two valves that control the closing speed on commercial door closers. One valve is the Sweep Speed and the other is the Latching Speed. The Sweep Speed controls the amount of time it takes the door to sweep from 70 degrees open to about 15 degrees. The Latching Speed controls the amount of time it takes the door to move from 15 degrees open to the fully closed position. To slow either of these speeds, just tighten (clockwise) the adjustment screws, this will slow the speed of the hydraulic fluid through the channels, and slow the closer down. The Sweep and Latching Speed valves are usually marked with a letter or number. The Sweep Speed valves are usually marked “C”, “S” or “1”, depending on the brand. The US made closers usually use the “C” or “S”, the imported closers usually use the number “1”. The Latching Speed valves are usually marked “L” or the number “2”. The other adjustments we see on door closers are Back Check, Power, and Delayed Action. Back Check is the amount of resistance the door closer offers if it is thrown open by wind or vandals. Back Check usually starts at about 70 degrees and up. 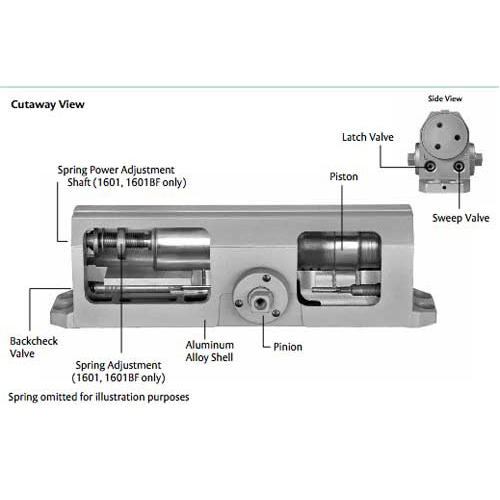 Power is usually on the end of the cylinder, and it is essentially a jack screw that increases or decreases the spring tension. The Power screw is also usually a larger screw or set screw. Delayed action is a valve to will hold the door open for up to 30 seconds to allow handicapped or the elderly through a door. For the Delayed Action to work the door must be opened to about 90 degrees. If your Door Closer is slamming we need to look at a few things. The first thing I would do is inspect the door closer and look for any signs of fluid. Another thing to look for broken components on the arms, make sure everything is nice and tight. One of the last things would be the environment, has the weather changed, is the air conditioning now on? Why do we inspect for fluid? One of the main reasons a door closer slams is the hydraulic fluid has leaked out, either threw the adjustment valves or the spindle seal. The spindle is what the arms attaches to, and they do fail, especially when the closer is mounted on the header, or top jamb. In these types of applications, the header tends to flex, which causes the closer to rock, which in turn wears out the seal. When the fluid has leaked out their is nothing to retard the motion, and the closer slams. What I would do is tighten the Closing and Latching Valves all the way, and then back them off a 1/2 turn. If it still slams then, the closer is shot. The environment plays a roll sometimes. If your door closer is sitting in the sun, the casting will heat up, and the oil will become very thin, and fly through the valves. I would try the same thing as we did above, tighten the Closing and Latching Valves all the way, and then back them off a 1/2 turn. Now we have either solved your door closer issue, or created a new one. If we have solved the issue, congratulations! If not, we need to get your door closer repaired, or replaced. When it comes to repairing them, I have had awful luck. After spending a couple of hours, the closer works and within a week it is leaking again. Replacing them might be the most cost effective way to get this thing fixed before someone gets hurt. 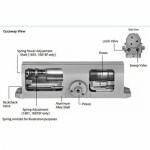 If you have an American made and manufactured door closer, they usually have a 10 to 25 year warrantee. The problem usually arises that you can not remember who you purchased it from, which the factories require. The factories usually want to know the Purchase Order Number the closer was purchased on. If your door closer is an imported version, usually the easiest way is to purchase another one, they are usually in the $50.00 range. We have our door closer information page on our website that lays out all of the door closer hole spacings and the models that are available with that pattern. We have an older Clarksdale Miss sl72 and I am not sure which screws I can turn to slow the closing of the door…I was hoping you could help? There should be a couple of small screws or hex screws, at least two of them, just tighten them, turn Clockwise. If that does not do the trick, then the oil has probably leaked out. If the oil is gone there is not much you can do, except replace the closer. Thanks for explaining that exit devices work by pushing fluid into a control valve which affects the closing speed. The door has been slamming a lot lately at my place of work, so I think we could really benefit from getting an exit device. Now that I know how they work, I definitely feel more prepared to suggest that idea!